First, the results. Since the World Series of Poker last year, I've played 174 hours of poker. I play limit hold'em, with almost all of my play at the $10/20 or $15/30 level. In that time I've made $7594, which is $43.70 per hour. I say that I'm a semi-professional, because obviously 5 hours of "work" per week isn't really playing at a professional level. Statistically speaking, it's also somewhat possible that I've just gotten lucky over this time. Considering my level of understanding of the game, including knowing what I don't know, honest evaluation of the competition, and a general comfort level with the game, I can objectively say that I don't think luck plays a large part in my results. Anyway, I say all that to let you judge for yourself my playing level, rather than having to take my word for it. Real professionals might disagree with some of my advice, but I'm offering it because I think that it's difficult to find the correct path towards becoming a winning poker player, and I've now discovered one such path. Subjectively, it feels awesome to be good at poker. When I go to Vegas every month, I assume that I'm going to leave with a profit of some sort, and am playing to figure out exactly how much it will be. In the same way a programmer takes for granted that he can build a simple web app, I've come to take it for granted that if I need money for something, I can just play poker. That's part of why I don't play more, actually-- it feels like pulling money out of the ATM that I'm not immediately going to spend. Proficient poker playing actually feels like a low-grade superpower. So today I want to share some parts of this journey. This post isn't about how to play poker, but rather how to learn to play poker. Despite tons of good resources and information out there, I found it difficult to know exactly how to tackle the problem of "getting good at poker". Hold'Em is a beautifully complex and satisfying game. I'd play it even if money wasn't on the line. Playing for money makes it a pure game which ensures that everyone is playing at the best of their ability. The only real "move" you have is to add money to the pot. No hitting, standing, or swapping out cards. Yet behind this simplicity are layers of math, psychology, and logic, all woven together. How hard is it to get good at poker? Not very. I started out playing $3/6. When I moved up to $6/12, I was terrified that everyone was going to be really good. They were horrible. I stuck around at $6/12 for a while, and then, hands trembling, moved up to $15/30. I was sure that everyone was amazing there. A few people were good, but most were pretty bad. After a few months of play, I was usually the best or second best player at the table. I recently took a shot at $20/40 and played two different games. At one game I figured I was fourth or fifth best out of ten, and at the other I thought I was one of the top two. Unfortunately, you can't just be in the top half to make money at poker. Because of the house taking money, you have to be one of the top three or so to win overall. Because everyone else is playing casually and without discipline, it just doesn't take too much to get to the top three. Before you ever start playing, you need to memorize starting hands. Start with Winning Low Limit Hold'Em by Lee Jones. It's not perfect, and you'll end up diverging from his recommendations eventually, but by simply following his chart, you'll have an enormous advantage over the other players at the lower limits. Buy a copy of Turbo Texas Hold'Em from Wilson Software. The interface is hilarious and it only runs on PCs on 32bit operating systems (or in VMware), but it's the best poker simulation you can find. Go through meticulously and make all of the settings as hard as possible, including having the AI learn your style. Turn off the animations and sounds to speed up play. Turbo Texas Hold'Em is amazing because it's fast. You can play fifteen hundred hands per hour. For reference, that's fifty hours of live poker. The AI isn't exactly like real life players, but it's close enough and the difficulty roughly matches to a $15/30 game. Once you've memorized the starting hands, start playing a couple hours of TTH per day, just guessing what to do after following the starting hand chart. This gives you some context for the game that will increase your comprehension when you read. After a couple thousand hands or so, read the rest of "Winning Low Limit Hold'Em". Keep playing Turbo Texas Hold'Em, but also start playing real life casino games. Start with a $3/6 or $4/8 game, which are low enough to be cheap, but not so low that it's a complete freakshow. At these low limits, the rake is proportionally so high that the games are virtually unbeatable. Even a firehouse can't fill a bucket with a giant hole in the bottom of it. There's just too much money being pulled off the table. So you don't have to wait until you're beating $4/8 to move up in ranks-- just wait until you are choosing your starting hands with no thought, aren't playing hands you shouldn't play, and feel like your post-flop play is one of the best two or three at the table. Complete comprehension and implementation of Winning Low Limit Hold'Em should get you there. It's important to be aggressive in moving up in limits, even if you're scared. The buy in for $6/12 is $200, which is a small price to pay for a test to see if you're ready to move up or not. Don't make your decision based on whether you win at the new level or not, but on how the game felt after a couple hours of play. If you felt like people were running circles around you, and you didn't understand what the better players were doing, don't move up. If you think you're in the top half of the players, do move up. You need better competition to progress, and sometimes you have to pay for it in the form of losing a small amount of money to the rake. Once you start playing $6/12 or $8/16 or $10/20 (depending on which of these your local casino has), most players will still be horrible, but you'll run into a few people that actually have some understanding of the game. Now you can put into practice slightly more advanced tactics like hand-reading, free card plays, and certain bluffs. To learn these, read Small Stakes Hold'em by Sklansky. The rake in these small/mid limit games is small enough that they are beatable. Keep at them until you feel like you're one of the best three players at the table, and are winning money. If you're diligent about reading the book and putting in some hours on TTH, it won't take long. The big skill to work on in these mid stakes games is hand-reading, which isn't explicitly covered in any of the books I'm recommending. The idea is that as your opponent makes his moves, you narrow down the range of hands he could possibly have. The goal isn't to figure out the exact hand he has, but rather what his "range" is, and how you fare against it. For example, if an opponent in late position raises a two-tone flop, but then checks the turn, it's extremely likely that he has a flush draw. If you have a pair, you can assume that you're going to win unless he he hits his flush card. The second part of this equation is to figure out which play will net the most money based on these assumptions. To continue the previous example, if a non flush card comes on the river, you should actually check, even though you know you're probably winning. Why? Because he might try to bluff at it and bet. If he DOES bet, you should call, but not raise. A raise will only be called by hands that beat you (like if he made a set on the river). Once you're becoming somewhat proficient at hand reading, move up to $15/30 or $20/40. Because these games are finally getting into the realm of stakes played by professionals, you have to tread with a bit of caution. The $15/30 game I play in San Francisco has a couple pros, but no one particularly intimidating. I played a $20/40 game in Seattle that was full of horrible players that I would expect to see at the $6/12. On the other hand, the one time I played $20/40 at Bellagio, it was a tough game. While moving up to this new limit, or even just before, read Hold'Em For Advanced Players. This book is more complex than the first two, and many of the plays it prescribes will only work against decent players. You should continue to work on hand reading and thinking very critically about how each of your possible plays will work against that range. Make sure to track your progress as you go. I like "Session Logger" for Android, and my friends like "Poker Journal" for iPhone. Once you settle in to your $15/30 game, you should be able to make about $45 an hour. It's not a huge amount of money, but it's not bad, and it's a fun way to do it. The last thing I'll mention is the importance of discipline. If I were to point out the biggest error I see opponents making, it's that they lack discipline. They want to play crappy pocket pairs early. They want to call one more street to see if they make their miracle straight. It's only a bet here and there, which seems negligible, but it adds up in the end. When I sit down at a poker table, my goal isn't to win. It's to play correct poker. I don't try to justify any call or fold-- I just try to do what I think is best. I don't always get it right, but that attitude has helped me avoid the emotional playing that would have easily turned me into a net loser. As for going beyond these limits, I just don't know yet. I definitely haven't fully absorbed Hold'Em for Advanced Players, but I imagine that doing so would be the first step towards moving up limits. I'm currently beating the $15/30 in San Francisco and the $10/20 at Bellagio in Las Vegas. I'm a bit intimidated by the $20/40 at Bellagio, and I don't have enough data to know whether I can beat it or not. I suspect I can't yet. I also don't know anything about online poker. For whatever reason, it just doesn't appeal to me, and I don't play it. As my awareness of the game grew alongside my profits, I was shocked to see just how bad most players are. They've put in the time playing, but without any real study, they're mostly reinforcing bad habits. You can do differently. With just a few months of concentrated study and play, I'm convinced that anyone can become a winning player. No pickup update because, honestly, this last week has been useless. my wing and I moved to Las Vegas for at least the next few weeks to remedy the situation. the full story will come out in the next update. I think this post may not be the best edited, but it's 5:15am and I'm running out of batteries, so I've got to post it. Do you know of any software that equivalent to what you suggested? I'm also curious about your thoughts on No Limit. I've only played no limit, should I be okay switching to limit? Too bad I live in Utah. there isn't a casino for an hour and a half away. Performing a balancing act of living an amazing San Francisco life while maintaining hyper productivity at Stitch Labs! You can often find me at the Armory Club. I also live in Utah. I have gone to Wendover a few times and it seems like there are too many rounders. I see the same four guys every time i'm there, about 2 times a month. Im not sure how to handle this problem since there are not many game going on at each casino, about 2 tables per casino, 1 limit, 1 no-limit. Having played poker more than I care to admit, I'd have to say that your sample size is much too small. On the lower side, you'll probably have to play at least 8 hours a day for a couple months in order to accurately figure out how much money you're winning. Also, if you're playing 20-40 or 15-30, an hourly win rate of between 1.5-2 big bets an hour is something only the most highly skilled players can achieve. Since you haven't been playing all that long, I'd suspect your luck probably has more to do with your wins than your skill. Start writing your reply here...you can not win 1/and a halve bets an hour.the books say 1 bet an hour .not so. in a 15 30 game if you win 15 an hour is more likely. figure your hands per hour then the racke. you might win a little. must play in high stakes game to over come your cost to play. Is there a poker simulator for a Mac that you would recommend? You can still use TTH, you just have to run it in a VM. Even on a Windows machine, I have to run it in a VM because it only supports 32 bit OSes. Fascinating and useful! Can anyone guide me as to how much time on average you would need per day to really get into this, starting from scratch with the info Tynan posted? I work full time (and actually like my job!) but it means I only get a few hours a day spare since I run in the morning before work and then get home around 6. If I was disciplined I could spend a good hour, max two a night learning it, is this enough? having a well paying job that you like is actually a plus in poker. You have a means to build a proper bankroll. Put a couple hundred a month away (save don't play)) for the limit you want to play. I am Mariam eve, few weeks ago i saw a post on how Dr eguaga is helping people win lottery, i have been playing for years now and i had financial issues, i contacted Dr eguaga for lottery lucky winning number and behold he helped me in winning $4,000,000.00 i have never seen a good thing like this all my life, to everyone out there, it’s not everybody that is naturally lucky, if you have problems winning lottery, the solution is Dr eguaga . He is real and guaranteed Contact Him on [email protected] or he is also on whats app on +2348162914633. I loved reading the strategies which the poker players can use while playing it online. I am a huge fan of this game and love to play it every once in a while. I also own one site where anyone from anywhere in the world can <a href="http://www.nettpokerguiden.com/">play poker and win loads of money</a>. My website has already thousands of member players. Anyone know of a good place to play limit games in the midwest? Unfortunately, everyone plays no-limit here in Tulsa. The stakes on limit games are too low to beat the rake. 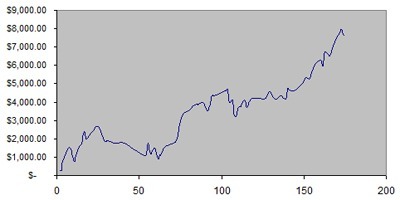 I've played 5000 hands of 2/4 limit against poker academy pro and have a consistent upward trending equity curve. I get an annoying amount of email from people asking me how to gamble like I used to. The truth is that what I used to do isn't profitable anymore. It was a right time, right place sort of scenario. Although I'm not a professional gambler anymore, I have been spending time studying and improving at poker (I'm a break-even or slightly profitable player), and I have friends who are pros. There are surely several different paths you can take to make a living gambling; this is the one that I'm aware of and is feasible for someone of above average intelligence. Despite offering a rough guide to making money gambling, I don't necessarily recommend that you do so. I gambled professionally for seven years. During that time I made a lot of money and enjoyed my life. One morning I woke up and all of my money was gone. The story behind that is complicated, but the gist is that "they caught on". The strongest emotion I felt was a sense of relief. Gambling is fun, but it's not "big". It doesn't contribute in a meaningful way or leave you with a body of work. Most casino games have a house advantage ranging from 2-5%, assuming "perfect play". That means that if you play perfectly, you can expect to lose, on average, about 2-5% of the action you put through a machine. Perfect play for slot machines is simply to bet the maximum amount of coins (the jackpot is skewed heavily in favor of maximum coins). For blackjack you need to memorize what to do for every combination of player hands vs. dealer hands, specific to each set of rules (hit on soft 17, resplitting aces, etc). Three times a week I spend an hour driving to the casino to begin my work. On the outside the casino looks like a Disneyland for adults with statues of roman warriors on the outside. 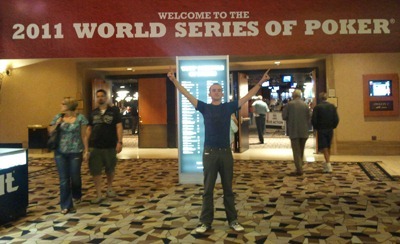 I walk in, greet the managers, employees and fellow players and place myself on the 2/5 poker list. For the following 10 hours I shuffle chips with one hand, browse the internet with the other and quietly observe others in order to exploit them. Despite my long-term success; playing poker each day presents me with new challenges. Every hour I face a $500 decision which I must be right more than 80% of the time to be a winning player. Sometimes I chat with other players. Sometimes I listen to music and act solemn. Sometimes I play the role of a douchy frat kid. More than 90% of the time I’m friendly with the other players and chat with every dealer. Everyone knows my name. Some players refuse to sit at my table in fear, despite that I’m really not that great. Playing poker for a living sounds like the dream, right? When everything is going in my favor I simply can’t help but see poker as a dream. One month I won so much I dropped a grand on clothes and it barely affected my monthly earnings. I have no boss, yet no employees. I have no schedule. If I piss my “customers” off it usually makes me more money. I can work whenever I want. Also the job is relatively recession proof: gambling increases during times of economic hardships. Sometimes I can watch movies while I play and still make great money. I can listen to music the whole time I play. Writing all of these benefits make me smile irresistibly. I’m literally smiling right now. Nearly every other day someone asks: “Should I quit my job to play poker for a living?” on the world’s only poker forum. Honestly, no you should not. Players are continuously becoming better. All poker players are becoming better. If I could go back 8 years ago with the knowledge I posses now, I would earn half a million a year easily. Poker is a dying business to dive into. More and more people start playing poker for a living with each passing day. You can continue to increase your skill level, but at a certain point your efforts are better spent elsewhere.